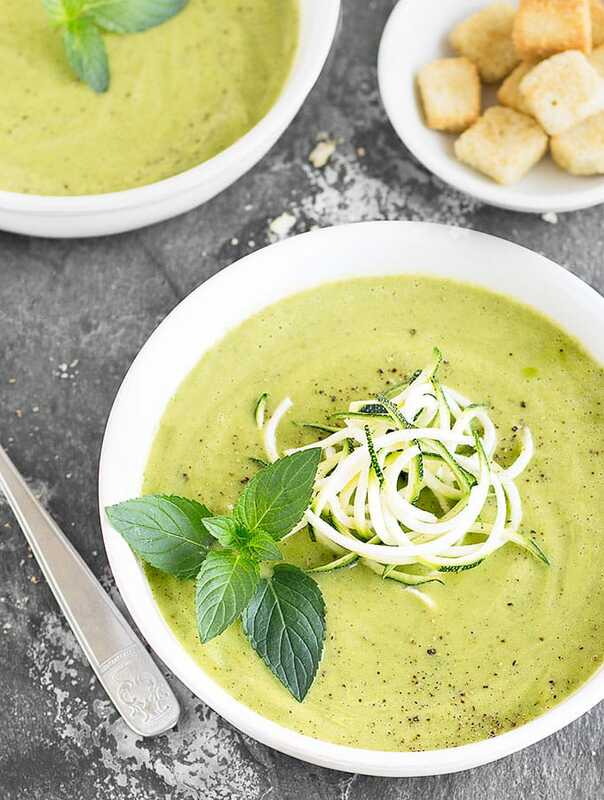 This light, healthy, and creamy zucchini avocado soup will keep you coming back for more! 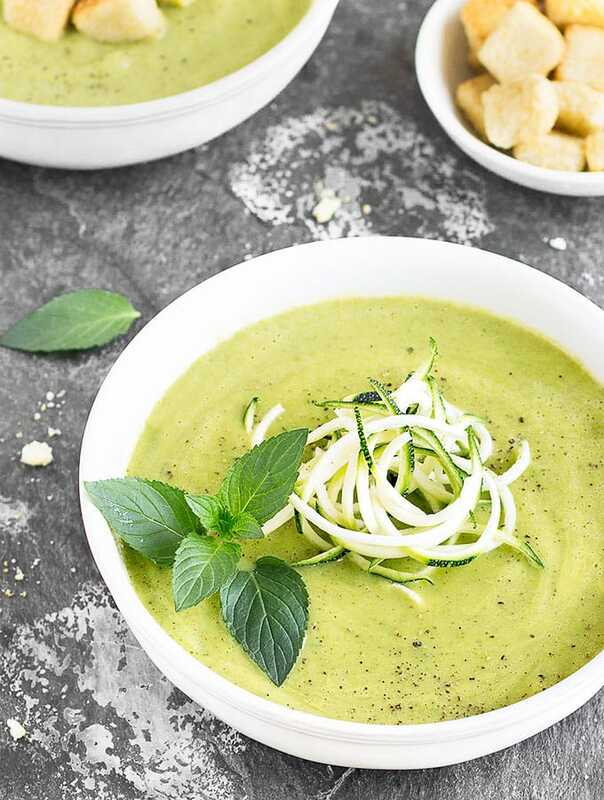 Zucchini avocado soup is easy to prepare, requires only a few ingredients and can be made in 20 minutes flat! 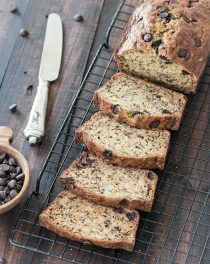 It’s a great recipe to use up the late summer zucchini bounty! All you need is: zucchini, onion, olive oil, garlic, vegetable stock, mint, avocado, lemon juice, salt, and pepper. Once the zucchini are cooked, stir in the avocado and mint, purée, season and you are done! Avocado is a fantastic way to add creaminess to soups without adding cream or milk. Use an overripe avocado, it will be easier to blend it. You could substitute mint with basil or cilantro for a unique, delicious twist. I like to top mine with freshly ground black pepper and zucchini noddles, but that’s completely optional. 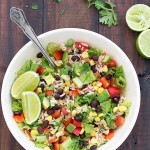 Sour cream, Greek yogurt, coconut cream croutons, diced avocado…are also great toppings. You can either purée the soup with an immersion blender right in the pot or pour it in a blender. If using a normal blender make sure not to fill it more than half full and allow the steam to escape. 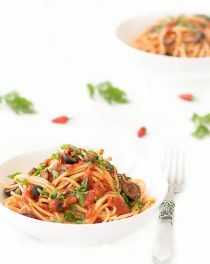 Serve it with a slice of crusty bread and a salad….dinner is ready! 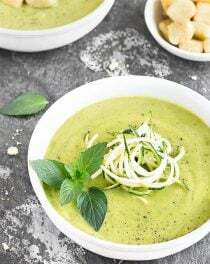 Zucchini avocado soup can be made in advance and reheated when needed. You can keep it for up to three days in the fridge in an airtight container, or in the freezer for up to one month. 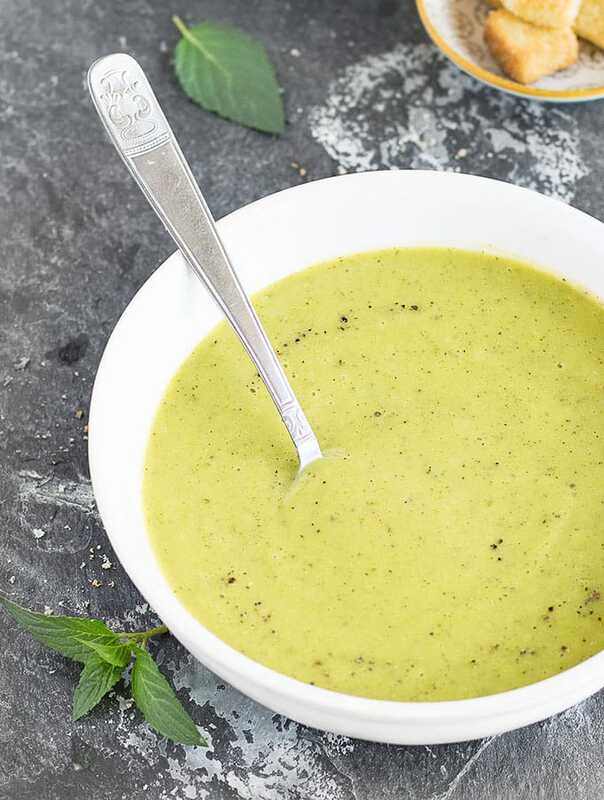 If you try this zucchini avocado soup let me know what you think! Leave a comment and don’t forget to take a picture and share it on my Facebook page or tag it #aseasyasapplepie on Instagram! In a large pan, heat the olive oil. Add the onion and garlic and sauté for about 5 minutes, stirring occasionally with a wooden spoon. Add the zucchini and sauté for another 5 minutes or until soft and slightly browned. Remove from heat and stir in the mint, avocado, salt, and pepper to taste. Carefully blend the soup in batches until smooth using a blender, food processor or an immersion blender. Stir in the lemon juice before serving and garnish with spiralized zucchini or croutons. It can be stored for up to three days in the fridge in an airtight container, or in the freezer for up to one month. I have made zucchini soup very similar to this, and will try this recipe. I think it’s good even served chilled. Sometimes I make it with cilantro and lime; other times parsley and lemon. When available in summer, I’ll serve it with a garnish of chopped watermelon, the soup either warm or chilled. I like your recipes!